Tomorrow I head to New York to attend a snooty work-related dinner at a snooty club. This is all well and good. I have attended this dinner a couple of times before and spent the night in said club. My problem is always trying to balance what to wear to comfortably negotiate New York City with what to wear to be allowed to walk in and out of the lobby of this place. The biggest problem, ultimately, is the shoes. As far as I have been able to discern, there’s no such thing as a shoe that’s both good-looking and comfortable—at least not comfortable in the sense that it can hold up to walking long distances in New York. The Club’s dress code policy is business casual. Business casual dress consists of professional and tasteful clothing you would wear in your workplace. For men this includes blazers or sport jackets (optional), collared shirts (dress shirts, button downs, golf shirts), turtlenecks or sweaters (including cardigans), tailored trousers (dress slacks, khakis, corduroys), and loafers or lace-up shoes with socks. For women this includes shirts (collared) or blouses with sleeves, turtlenecks, sweaters and sweater sets, skirts or tailored pants, and flats, pumps, or boots. Inappropriate attire includes but is not limited to denim, shorts, tee shirts (sleeveless shirts, tank tops, halter tops, crop tops), sandals (beach sandals, Birkenstocks, flip flops), athletic wear of any kind (sweatshirts, rugby shirts, sweatpants, leggings, stirrup pants, jogging suits, spandex, lycra, athletic shoes or sneakers, caps), torn clothing (clothing with holes or frayed ends), clothing with offensive or profane language, and provocative or revealing clothing. Please help keep the Club one of New York’s most distinctive and distinguished spaces by dressing appropriately. The last time I went to this gig, I bought a white blouse for the occasion. I hate white blouses. But I found one I actually liked and wore it in and out of the place. At least I think I did. After that trip, the blouse mysteriously disappeared. I never saw it again. Over the last couple of weeks I’ve hunted for a tolerable collared white blouse. But to no avail. I refuse to spend a lot of money for a piece of clothing that annoys me and that I will never wear. Except to walk in and out of this club. I bought a pair of shoes I may or may not wear. They are pretty cute. But will they hold up on a street commute or will my feet be reduced to bloody stumps? It’s the bloody stumpage that gets to me. It’s snowing/raining today but is supposed to be nice tomorrow and Friday in the city, with temperatures in the 70s F. I’ve got the snooty outfit for the snooty dinner covered. I just need to find an outfit that both looks good and will accommodate street-walking shoes that meet the dress code. Unless I find dress pants that go great with cowboy boots, I’m likely screwed. Tim almost always gives me daffodils for my birthday. I like their bright yellow promise of spring, even though, in early March, we in Vermont still have a lot of winter to get through. 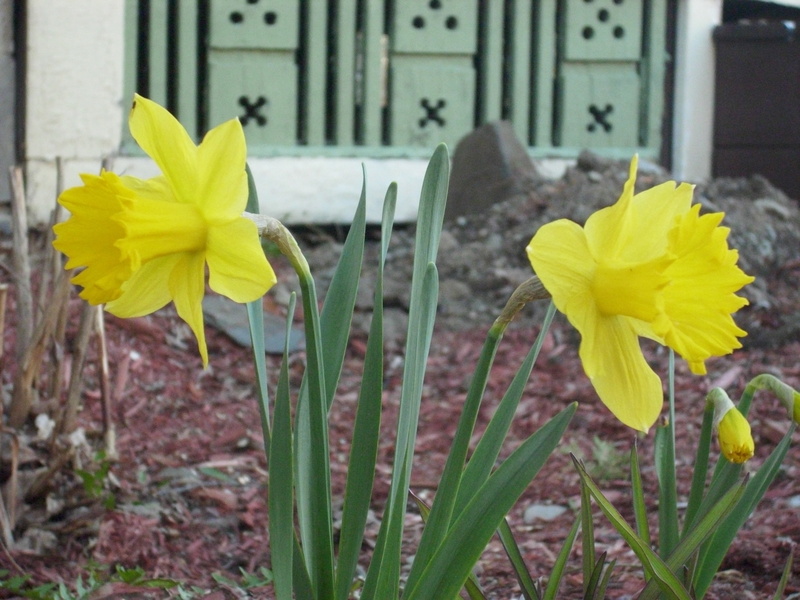 Last October, unbeknownst to me, Tim took bulbs from the daffodils he’d bought that year and planted them in front of the house. Not many of them—but they were my belated birthday present. He didn’t mention them until right before he left on this long business trip at the beginning of April, when the first of them started pushing their way through the ground. Stems only. 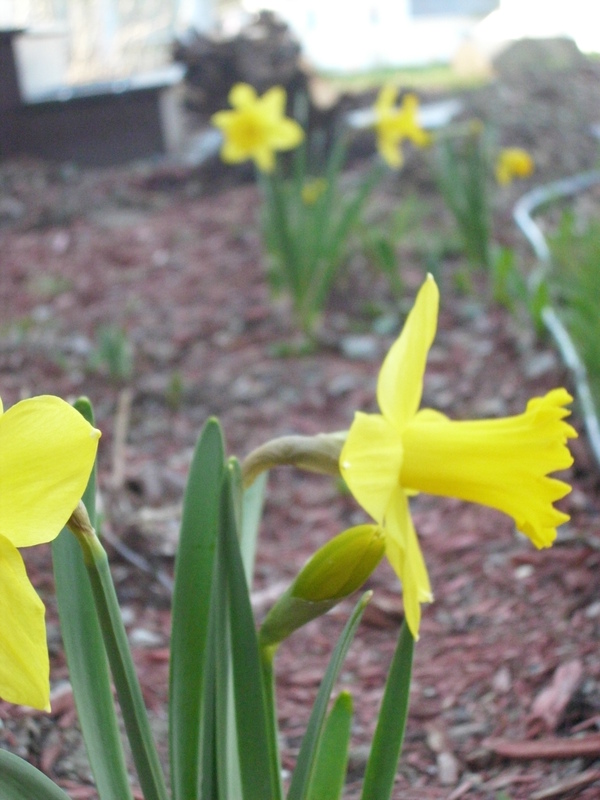 They were a little behind the established daffodils around us. On the day I left, the first one was beginning to show signs of its flower. So when I got to Portland, I asked our sweet neighbor Lynda if she could take a couple of photos of them, as I was surely going to miss them completely. Apparently the position she needed to put herself in to take such a photo provoked friendly cat calls and whistles from the neighbors across the street. She is a good friend. And now I get to see my birthday present full bloom! Tim’s on his annual I’m-away-on-business-for-a-month trip, and yesterday I got in the car and drove 5 hours to join him here in Portland for a bit of it. Which means I don’t have to obsess about when my neighbor will next come pounding on my door, and I will no longer have to watch TV in a completely dark house hoping he’ll think I’m not home. I also won’t have to be around for the porch-floors-replacement project, but I’d be shocked if that were completed by my return—bad weather is forecast, after all. I have a lot of work I have to do, and I did some reading today to get in the mood for this (yet-another) birth control project. But the sun is shining, and I stopped that reading to catch up on blog reading instead, and even though I have nothing to say, which has been my biggest problem of late, I’ve decided I will post anyway just to say hello. The sun is shining. The bottom of my second-floor window is the height of the top of a blooming cherry. I can see the water of the bay, and there are musicians playing across the street—a guitar and drums. I hear only the drums. Today I picked up lunch for Tim and me (while Tim got in a lunch-break run) at Colin’s very successful sandwich shop. Colin always greets me personally, and even though I’d had to write down what Tim wanted, Colin was able to recite Tim’s usual order before I said a word. Tonight I will go to one of my favorite restaurants, whose chef was a James Beard semifinalist this year and is due to deliver a baby next month—I better get in there while I can. I plan to have my favorite dessert. Last Friday, our friends Tim and Valerie stopped by for a visit. Tim and Valerie are Northbrook friends. We saw them the same week every summer for years. We chalked up a lot of good times. (Tim took that photo of us crossing the river—the one I posted a while back.) We had never visited outside of Northbrook before and hadn’t seen each other since our last day in the lodge’s parking lot in 2008. They are building a house and were in Vermont to purchase slate counter tops. Parts West is in the Slate Valley, so we arranged a visit. On the way here, Tim stopped to fill his car with diesel. The automatic shut off did not. His pants and shoes were splashed with the stuff. I, not giving it any kind of thought—obviously!—offered to wash Tim B’s diesel-soaked jeans. Reader, in my defense, I hadn’t ever washed anything gas soaked before, and I was all excited about seeing my friends, and I didn’t think this through in the slightest. Nor did anyone else. So when I pulled those jeans out of the washing machine, not only did they still smell like diesel, but so did the washer. But we decided to not dwell on it. We hung Tim B’s jeans in the bathroom, which soon also reeked of diesel. When the jeans were dry enough (middle of the night), I stuffed them into a plastic bag. Valerie was mortified. I was worried but was oddly Zen about it. I got online to look for advice. Some of it was conflicting, but I went with this: Scrub the washer down with Pine-Sol. Let it air for awhile. Run a load of old towels in a hot soapy cycle. Repeat if necessary. It was probably OK after the first run through, but I went for twice. And it was fine. Whew. In a panic, I sent him word that no, that was wrong, he’ll probably get the package back . . . Then I thought to call my former post office. Getting a post office phone number is hard these days—one has to use an actual local phone book, because the Internet only leads to an 800 number, and the 800 number people will never give out a local post office number. At least, this has been my experience, so I didn’t even bother to try this time. Luckily, I found a local phone book and the number. “Hi—a package was just mailed to me there, but I don’t have a box there anymore,” I started. “Box 84?” said the voice. Unbelievable. She looked, but couldn’t find it. I said I would come by Thursday to pick it up, and she said she’d have it. So Dhyan, a postal worker whose husband used to work where Tim does, clearly just sent the package to Tim’s place of employment with the rest of the business mail. This shouldn’t have surprised me, and yet I am awed. I called the post office the next day to make sure everyone knew we had the package. And now Tim B has the right address. Now here is the next turn in the story of my pants. Valerie had soaked my pants in Pine-Sol overnight and then washed them in the machine. Today, she placed them over the upstairs railing to dry. When I came home, I thought that we had a problem with the oil furnace. No, it was the remaining diesel smell of my drying pants. When I was young, I wrote a lot of letters, and I had a lot of pen pals. I can’t remember how I found all these people or how they found me—lists here and there, published somewhere. One girl who found me was Holly. She lived several hours away and had an identical twin. We wrote each other a lot, told each other everything, became close. Eventually we wanted to visit each other. I think we visited twice. Once I got to meet her at her house when my parents were traveling, but I don’t think I stayed there. Another time she came to visit me for a couple of days. This was soon after her bout of anorexia, for which she had been hospitalized. It turned out that being together in person wasn’t like the letters at all. It was kind of awkward. I don’t know how much of it was that I was a rather big girl who also hated my own body but couldn’t stop eating and she was barely 80 pounds. I don’t how much of it was that I am introverted and shy and hadn’t developed enough coping skills to mask that. But in person, it just never took, and we eventually drifted apart. Even though I’m an adult now, even though I am much better at compensating for my shyness, I am still nervous about meeting people I’ve dealt with only online or over the phone. So I was, of course, a mix of excited and shy at the opportunity to meet Cedar Waxwing yesterday as she and her husband and son were whirlwind-touring colleges. They and Lali (fellow neighbor and blogger) and I were going to have after-lunch sweets at my place. It was delightful and in no way reminiscent of the Holly incident. They are an interesting and engaging family and a lot of fun to be around. CW is as pretty and petite as her photos suggest (and I’m better about being Not Petite). Of course, my hostess anxiety kicked in, as it does even with people I know well. For example, I had to make coffee for everyone in the large Bodum French press. We don’t often use the large one, and I was trying to remember how many scoops to use. I thought I remembered seven and decided to go with eight—better stronger than weak. The thing is, I gave up coffee a few weeks ago, so I didn’t even taste it. That haunted me. Did I serve bad coffee? Was it too strong? Was it too weak? And then I realized it was French, not Italian roast, and I probably should have used one more scoop. And then I realized that we were out of our regular brand and this was a brand I didn’t drink very much. This morning I had Tim taste the cold leftover. Yes, I am that neurotic, and if any others of you come to visit, I promise to be that neurotic for you. Bring your opera glasses for the best view. I calm down after a couple of drinks. There is also the whole Hug Protocol Thing. I am a hugger, and I hope that that was truly OK with them. I am sure they would not tell me if it wasn’t. They were lovely. We went to Lali’s and visited with her husband and dogs and admired the wattle fence in progress. Everyone listened to my extended version/continuing saga of A.N., who mercifully did not drop by to present his daily problem until after everyone had gone. I am still hoping for a one-on-one sometime with Waxwing if I ever get down her way. A bird walk? Lunch or coffee at a real restaurant (abundant in her neck of the woods but difficult to find near Parts West)? And of course, we are dreaming of a bloggers’ trip to New Zealand to visit Mali, all the while knowing that it is way more likely that if we meet her, it’s because she’ll travel here.